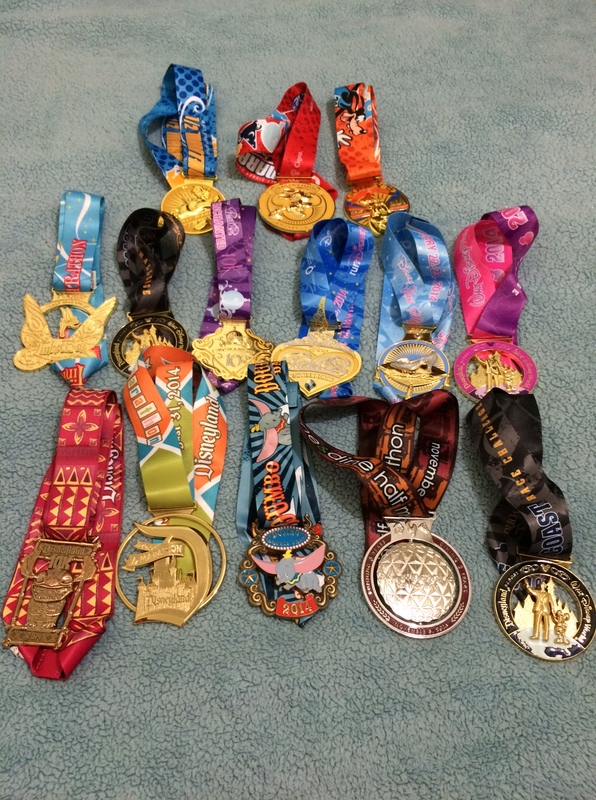 So this year I ran a few Disney races. I ran a total of 8 races which equals to 104.10 miles and 14 medals. I won’t get into how much money I spent. I had fun traveling to Florida and California but prefer going to Florida because 1) It is closer and cheaper and 2) More parks and more things to do. I remember when I signed up for the Goofy Challenge and I was nervous and scared. Running a half marathon is tough but then to add a marathon the next day? What was I thinking? I wasn’t. My friend, Jaime, convinced me to do it so I did. She did Dopey Challenge (5k, 10k, 13.1, and 26.2). At the end of the marathon I was almost in tears because I had accomplished something that I did not know I was capable of. Plus, I enjoyed the course more for the full than the half. I was also very sore. But I recovered quickly because the following weekend I went to California for the Tinker Bell Half Marathon. Traveling there was nerve wrecking because there were problems with my flight and I got to the hotel after 5pm. I was too late to pick up my packet but luckily I picked it up on race day. I was not able to get my shirt but someone was nice enough to mail it to me. I liked the race and the course. The weather was perfect too. The last time I was in Disneyland was in 1991 so I stayed an extra day to hang out in Disneyland. In February I went back to Florida for the Glass Slipper Challenge (10k on Saturday and 13.1 on Sunday). Definitely so much “easier” than Goofy Challenge. I ran the Enchanted 10k with Jeff Galloway and it was nice to chat with him. It was muggy and humid that morning but I finished early enough to head back to the hotel, shower, eat breakfast and hang out at Magic Kingdom with Arasally. We had a blast! The last time I was there was in 2004 (I did run through there in January but did not stay at the park). The half marathon was OK. Nothing too exciting about it. 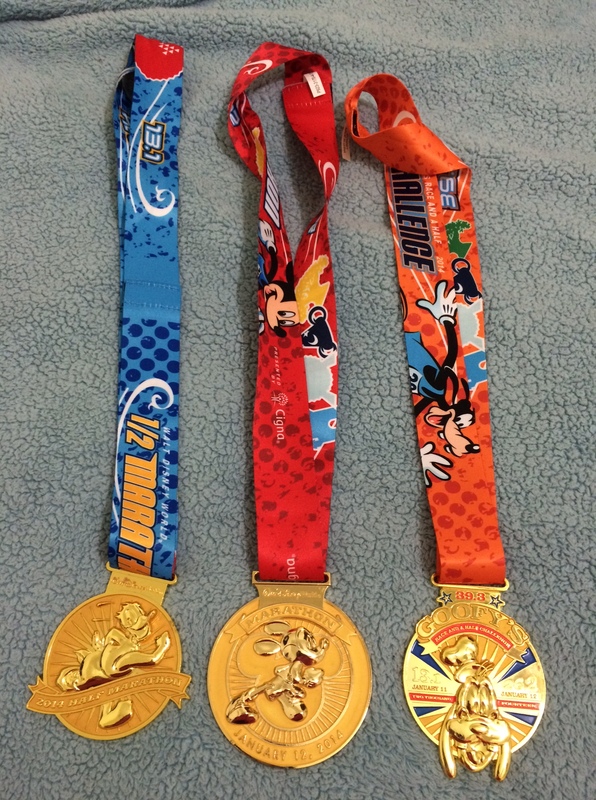 At the end of August was another trip to Disneyland for the Dumbo Double Dare (10k on Saturday and 13.1 on Sunday). This time I made sure to leave early enough to avoid any problems with my flight. I saw Jaime again and it was fun hanging out with her. I knew Emily was also planning to run the half marathon but I did not see her at all. I liked the 10k but not so much the half marathon. It was cool running through Disneyland and California Adventure Park but could not wait to finish the half marathon. I did like the medal I got for completing both races. Finally my last race was last month. I was nervous and excited about that one. The race was at night and I am not a fan of night races. The weather was pretty decent during the day but then things turned for the worst. It rained pretty much the whole time for the whole race. I heard good things about the race and was looking forward to it and the post race activities. I was cold and miserable. I could not wait to finish. I walked a lot, which made it worse. I know this was out of Disney’s control but the rain ruined it for me. However, the best part of the race was seeing all of the beautiful lights in Hollywood Studios. Each race is a fun experience. I like the Disney theme and seeing the various costumes. I prefer traveling to FL than CA. But unless you have a car or stay on property, it is much easier to get around in CA. When traveling to FL make sure to stay at a resort. Disney does a great job of providing shuttle busses from/to the airport and to/from the expo and race. Why, oh why, is it so expensive for these races? I know I spent over $300 for Goofy Challenge and while I did get 3 medals and 3 shirts, there pretty much nothing in the goody bag and in the post race box snack. 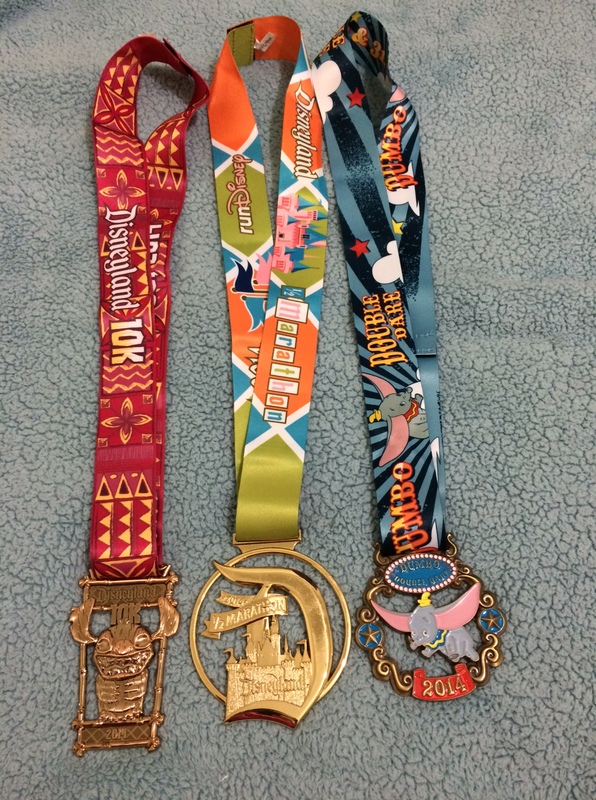 I told myself I would never run another Disney race but am finding myself drawn to the Avengers Super Heroes Half Marathon in 2015 and the Glass Slipper Challenge in 2016. Part of me wants to run again the Wine and Dine Half Marathon and actually enjoy the race. Ugh, I will not miss the 3:00 wake up calls. Those were brutal. I understand the reason behind it but they’re still brutal. Every runner has to run one Disney race. They are so expensive because people will pay it! And, paying for a “brand” name. I was signed up for the Disney HM in January of 2009 but we couldn’t go because of money issues. Now that I know more about running and myself, I think that was a good thing – I don’t think these races are for me, or every runner. But I love hearing about them! I love how you say that those races are not for you. 🙂 The reason I said I would never do another one again is because I am disgusted at the price. And you are right that people will pay for it. Disney can increase the price and people will pay no matter what. That is so great that you are planning to do the Disney races. Make sure to plan ahead for registration day because they all sell out fast. Luckily I am an Annual Passholder, so I typically get early access to registration. I was able to score a spot for the Expedition Everest Challenge that way. I can imagine how hard it must have been to try to register when it opened up, that one sold out in under 2 hours. I didn’t realize you had done so many! 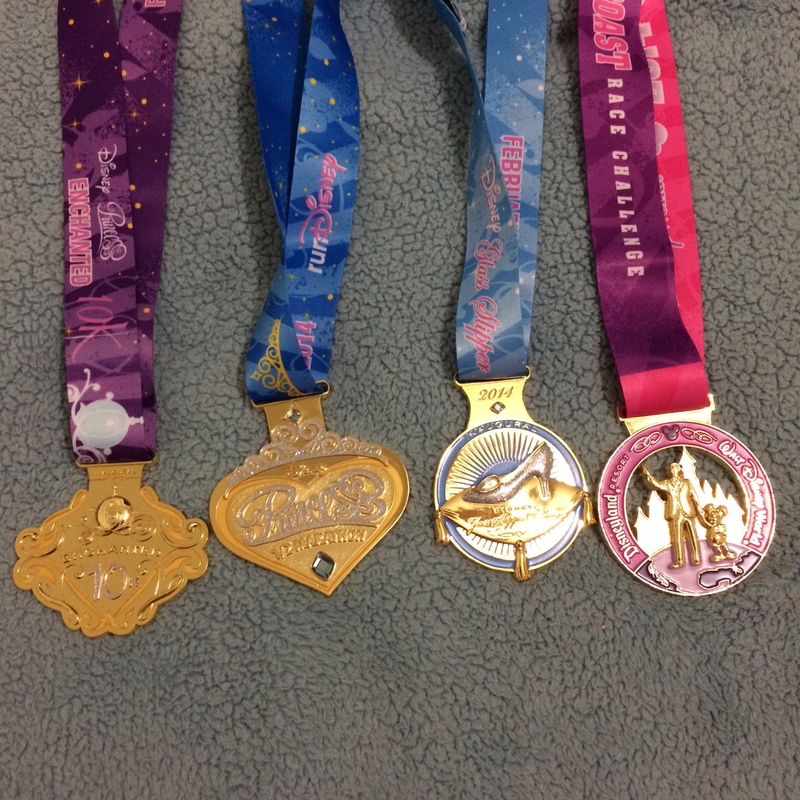 I love that pink medal best, but agree that Disney races are super expensive for what you get, so probably wouldn’t do another. A Disney race is totally on my running bucket list! It looks like such a blast, and it’s awesome that you’ve experienced all of them! Definitely makes plans to run a race. If you do the Princess Half Marathon then I’ll go with you. Congrats on running so many successful races this year! My first marathon was Disney and that was enough for me. They are way too expensive! thats a lot of Disney miles! I still haven’t done one and I don’t know if I ever will. So much money. And excited for you and your 2015 in 2015 goal!